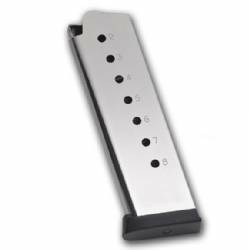 This Sig Factory 1911 Magazine fits Sig Sauer Full Size 1911 variants as well as most other 1911 Government and Commander-sized pistols in 45 ACP. It will function in most Officer-sized 1911's as well but will extend below the grip frame. Stainless steel magazine body with a black polymer floorplate. We are proud of our customer service and of our feedback!